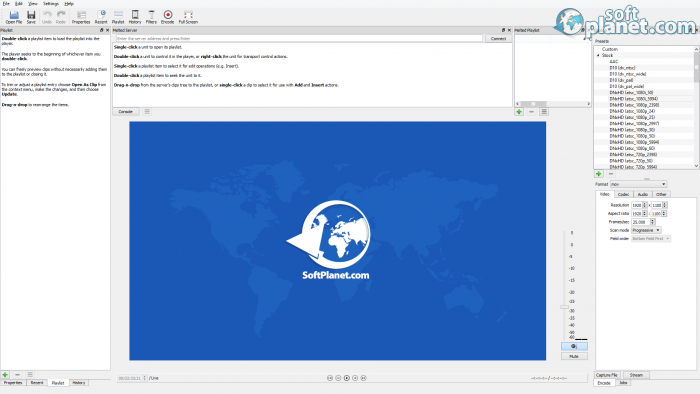 SoftPlanet makes it possible for everyone to get free Shotcut download directly from our servers. There is no registration needed for downloading. There are many video file players with some of them counting on their looks, others on their performance and third on a variety of functions. Shotcut doesn't count on looks, but in the mean time it has great performance capabilities and a lot of functions, which makes it a program that deserves to be downloaded. And of course let's not forget that it is free, which only enhances its good characteristics. All this is wrapped in a simple interface only to point out that this is an app focused on functions and performance. Supporting a lot of files seems to be the main goal of Shotcut as it does not play only video formats, but also audio and image formats. A good feature of the app is that it shows the exact milliseconds of the video and audio files, but the exactness of the app is not only in playing, because it shows the level of sound, as you can see it for the right and left channel and also you can see what the decibels to the thousands behind the decimal point are. The interface of Shotcut is the only bad side of the app, because it is simplistic and has no other features, than to give you the tools to work with. But in the mean time you can turn on a lot of additional windows in the main screen, so for sure functionality is the main topic for this app. You can turn them on to see filters, properties, recent files, history, encoding etc. This makes the interface adaptable to your needs, as you can also use the program with seven languages. There are several video modes in which you can view videos with Shotcut, but this is not the only good working feature. You can also view the encoding and adjust it to exact aspect ratio, resolution, bit rate, buffer size, frames, KHz of the sample rate and a lot of other functions that turn this app into a useful tool for any situation and device. The only thing that you should avoid looking at to evaluate this video player is its interface as it is very simple. But Shotcut comes with a lot of tools, functions and adjustable features, which turns it into a great player not only for videos, but also audio files, as you can call it a master of exact values. Our security scan shows that Shotcut is clean from viruses. The current version of Shotcut has been scanned by our system, which contains 46 different anti-virus algorithms. That ensures that Shotcut 4.8.1 is 100% safe for your computer.